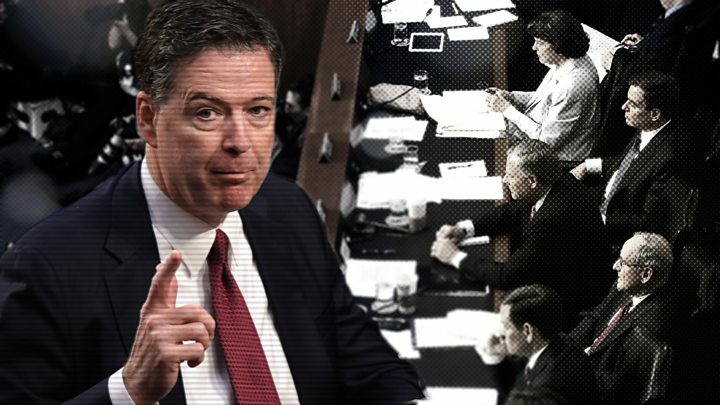 James Comey may not have added much new detail in testimony on Thursday about his one-to-one meetings with Donald Trump but he did add something: he set the scene, and law professors say that could be a missing piece in an obstruction of justice case against the president. Mr Comey, the former director of the FBI, gave three hours of evidence in front of the Senate Intelligence Committee, describing personally for the first time the series of exchanges with the president that led to his sacking last month. In one of those exchanges, the president said he "hoped" Mr Comey could "find his way" to dropping an investigation into then-national security adviser, Michael Flynn, a Trump ally who was under scrutiny over his ties to Russia. We knew that already - Mr Comey made details of the meeting public several weeks ago - and Committee Republicans sought on Thursday to paint it as an innocent exchange: "I hope" was not an instruction, they said. The former FBI director declined to offer his own opinion at the hearing on whether the president was attempting to obstruct justice, saying only that he found their exchange "very disturbing". Whether the president had broken the law would be a matter for special counsel investigator Robert Mueller to decide, he said. So what's changed? Alex Whiting, a Harvard Law professor and former federal prosecutor, said the oral testimony gave new and legally significant insight into how Mr Comey interpreted the president's words in the moment. "The critical aspect of an obstruction case is assessing the intent of the speaker and whether it was corrupt," Mr Whiting said. "People communicate with much more than words, and some of the best evidence for what a speaker meant can be how the speaker was understood at the time." Mr Comey testified on Thursday that he clearly understood Mr Trump to be pushing him to drop the inquiry. We also heard for the first time that the president cleared the room before making the remarks, removing even Mr Comey's boss, the attorney general. Added to that, Mr Comey, who has a long history of high-profile legal positions and who took meticulous notes directly after his meetings with the president, was a "dream witness", Mr Whiting said. "I think if you take together his written and oral testimony together, he has now made a prima facie case of obstruction of justice. "Whether it's a case that should be prosecuted, or whether it merits impeachment, those are separate questions, but the elements are now there for obstruction. There was a corrupt intent to impede justice. I think you could charge this case." 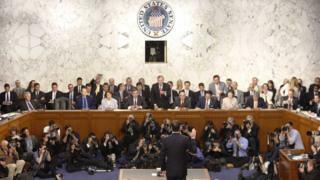 Eric Posner, a law professor at the University of Chicago, also said that Mr Comey's oral testimony had changed the legal picture. "Comey may not have added specific pieces of information, but the way he presented himself and consistency of his account, and the coherency of the account, all of these things are important," he said. "In his oral testimony, he made it clearer that he believed Trump was trying to obstruct justice. He said that when Trump used the word hope, he understood that to be a command of some sort, and that strengthens the case for obstruction. "It was a borderline case before, now it is somewhat stronger." But the case remains essentially circumstantial, said Michael Gerhardt, a law professor at University of North Carolina who testified at the Clinton impeachment hearings. "Everybody is parsing the words of course, but I don't know that Comey's testimony strengthens or weakens an obstruction case," he said. The meetings described by Mr Comey were however "clearly inappropriate", he said. "This is simply not how Americans want a president to conduct himself." The testimony would serve to strengthen Mr Comey's credibility with congress, Mr Gerhardt said, possibly at the expense of the president. "Comey put his credibility on the line today and he did it in a very public way," he said. "Now it's a credibility contest between him and the president, and I think it's safe to say Comey is winning that contest." That could prove crucial if legal action were ever taken over this affair. Were the president to face impeachment or criminal proceedings, the former FBI director would "without doubt" be a central witness, Mr Whiting said, and his credibility against Mr Trump's would be key to the case. Both those scenarios remain unlikely however, at least for the meantime. It is effectively impossible to bring criminal charges against a sitting president - the case would have to be brought by the executive branch, of which Mr Trump is the boss. As for impeachment, there is political resonance to obstruction of justice charges - it factored in the impeachment of Bill Clinton and the resignation of Richard Nixon - but it is still highly unlikely. The Republican party controls both houses of congress, and a special counsel investigation into the Russia affair is only in its infancy. So Mr Comey's testimony will not trigger legal proceedings any time soon, but it does have the potential to damage the president's political standing and resonate with moderate voters, Mr Posner said. "Obstruction of justice is clearly on the minds of a lot of people and I think it damages the president politically," he said. "He continues to have supporters of course. But for many people in the middle, their opinion of the president will decline and their reservations will strengthen." Is Trump's thin skin getting in the way of his presidency?